Longtime communications strategist Merrie Spaeth interrupted an interview between a Texas TV station and former Baylor University president Ken Starr this week. The cameras kept rolling. 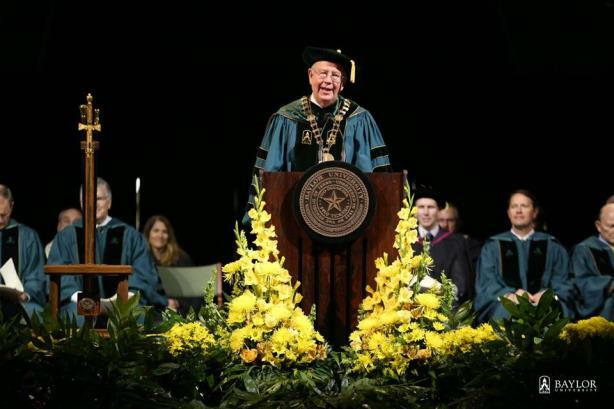 Starr at Baylor University's most recent commencement. (Image via Baylor's Facebook page). When a local TV station questioned former Baylor University President Ken Starr about the school’s latest scandal, communications specialist Merrie Spaeth interrupted after the reporter asked him about an email he received with the subject line, "I was raped at Baylor." After KWTX reporter Julie Hays asked him if he saw the email, Starr said, "I honestly may have. I’m not denying that I saw it." His answer prompted Spaeth to interrupt the Q&A and ask the news director not to use that portion of the interview. After the journalist refused this request, Spaeth met with Starr and directed him to change his answer, twice. And the cameras kept rolling. The video showed Starr returning to the interview and Spaeth off-camera asking Hays to repeat the question, saying she doesn’t want the answer "mis-edited." Starr’s response: "I honestly have no recollection of seeing such an email and I believe that I would remember seeing such an email. The president of the university gets lots of emails. I don’t even see a lot of the emails that come into the office of the president. I have no recollection of it. None." Spaeth has long been known in Republican circles for her ability to craft media messages and handle crisis communications. She previously worked with Starr during his investigation of the Clinton administration as an independent counsel, when he gave testimony recommending impeachment. Starr said earlier this week that he is resigning as the university’s president but staying on as a law professor. During his interview Wednesday with KWTX, he said it was a "matter of conscience," casting himself as a proponent for transparency. "That's why I resigned, as a matter of conscience, so I can call on the board of regents, who are good people and love Baylor, but they have continued to follow a policy that I had to follow as an official. But I urge them toward transparency, transparency," he said. Spaeth is the founder and president of Spaeth Communications, a Dallas-based firm started in 1987 with a focus on strategic consulting, training, and crisis communications. The shop has offices in Columbus, Georgia; Washington, D.C.; Portland, Oregon; and Singapore. Spaeth has also served as director of media relations and special adviser to President Ronald Reagan and special assistant to the director of the FBI, according to her LinkedIn profile. "Our job is to help clients tell a truthful story effectively, but KWTX is correct with my quote that I should not have interrupted," Speath said via email. Repeated requests for comment from Baylor University have gone unanswered. This story was updated on June 3 with comment from Spaeth.